They could get work in Lamu's booming tourist industry, which has brought an influx of pop stars, models and glitterati - and much needed income - to the island over the past 15 years. But tourism has also introduced alcoholism, drugs and soaring house prices that are threatening the local Islamic culture and way of life. But how else will they earn enough to secure their precious certificates - and their future? 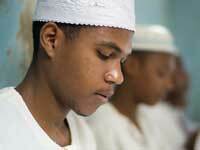 And can the West really offer a model of globalization that will win over Lamu's young men? What future will our three young protagonists choose? 2. Castro Or Quit - Two young doctors in Venezuela have to decide whether to leave the country or stay with their patients. "The Edge of Islam DVD is a wonderful example of the kind of demonstrative tools available to undergraduate instructors of sociology, as well as for instructors in other social science disciplines (e.g., political science, anthropology, geography, economics, religious studies, or global studies)...Provides an empirical anchor for discussing Emile Durkheim's theorization on religion and ritual, Samuel Huntington's clash of civilizations thesis, George Ritzer's conception of McDonaldization, and Immanuel Wallerstein's world systems theory, among other topics frequently covered...In my judgment, the Edge of Islam should be used in a range of different social science courses in years to come." "What is the 'right' way to live in the modern world? Education is essential to access the myriad opportunities in the global village, however, this documentary illustrates that for the youth of Lamu, Kenya, success often requires that they must balance their westernized aspirations and their religious principles on a veritable razor's edge." "Life 6 is a wonderfully educational series that presents the viewers with the dilemmas faced by specific individuals in the socio-historical and economic context of their communities in the midst of an increasingly globalized world. The tremendous value of this series is that, in the brief thirty minutes that each episode lasts, it captures the complexities of the lives of those in it as they face Western influence that force them to reassert, defend, or challenge their local and/or individual identities, cultures, governance, wealth distribution, and practices of achieving justice and reconciliation--to name a few...Life 6 represents these issues in an objective and analytical way that will--without question--lead into a discussion and debate about them by academics and lay audiences alike."